Constant work on a computer can have consequences on one's health. This is why it's important to take regular breaks, to stretch your legs and rest your eyes. 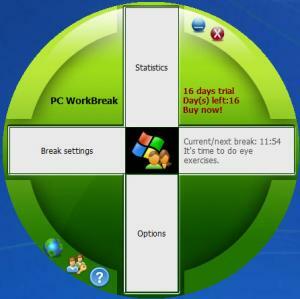 PC WorkBreak can be used to schedule reminders for various breaks. It is a simple utility, with a straightforward functionality, but it can have positive effects on your health, if you actually follow the break suggestions. The software is free to try, without any functionality restrictions. It is available in various languages, for all popular Windows versions. Its setup file is small and you can install its components in under a minute. There is no need to install any prerequisite tools and you don't have to sacrifice too much RAM or processing power. PC WorkBreak presents a few simple options on a small and well designed user interface. The important options can be found on the break settings panel. Here you can choose between various break types and decide how often you should take them. The software lets you schedule regular work breaks, as well as short breaks, for stretching, walking and restring your eyes. You can schedule a break reminder to occur at a fixed time or at a specific time interval and you can also set its duration. Each type of break reminder comes with its own unique animation, which is displayed on the screen when the reminder is triggered. The software provides you with detailed statistics about your breaks. They include grades, which are based on the time it takes you to stop the reminder. If you take a full break, as indicated in the reminder, you will receive a high grade, but if you close the reminder early, you will receive a lower grade. To avoid inaccurate statistics, you can set up no break periods, if you plan to leave the computer running by itself. With PC WorkBreak's simple and straightforward functionality, you can avoid all sorts of health issues when using a computer. The software is quite flexible when it comes to scheduling work breaks. Its controls are well organized and easy to learn. PC WorkBreak is lightweight, it can be installed quickly and it doesn't use too many resources. You may need to remove the predefined schedules, because they will conflict with new settings. You can download PC WorkBreak free here.